You have to agree with me: the average laundromat is not very attractive or cozy at all, but there’s none of that in Wassalon 4U. 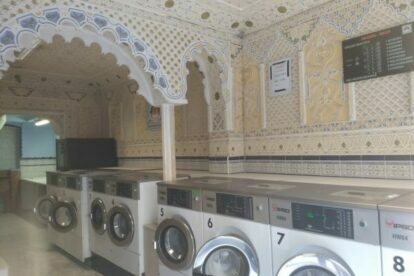 On your way for a drink in the park nearby or while discovering this international neighbourhood, you may want to stop and have a look inside this self-service laundry. It’s impossible not to admire its magnificent beauty. Despite not immediately identifying the name with a very exotic place, you enter a small oriental palace. It used to be a living room of a family and the owner of Wassalon 4U was smart enough to keep the Eastern-decorated interior. I hope this will inspire more owners of laundromats or other entrepreneurs. If you have dirty laundry, you can go for the full experience; doing laundry can become relaxing and amusing again if you have to wait here! I dare you to show me a more original laundromat!